New 300 ml Table Top Pneumatic Piston Filler, Model DGF. This is a Semi-Automatic liquid filler that can fill a variety of different products, from water to a thick paste. Unit can be operated by foot pedal or by automatic timer. Can fill free flowing products from 30ml to 300ml at speeds up to 25 bottles per minute, depending on product and size of fill. 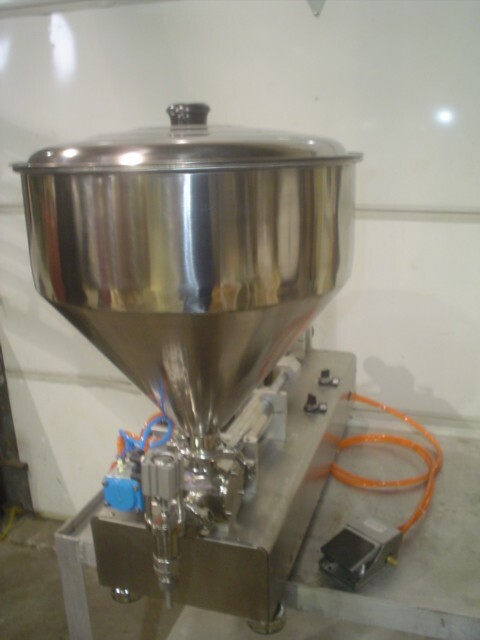 Machine is constructed entirely of Stainless Steel and comes with a Stainless Steel Product Hopper, Airtac Main Cylinder and a 1/2" diameter filling nozzle. Air requirements: 0.4 to 0.6 MPa. Delivery Time: Approx 8 weeks.